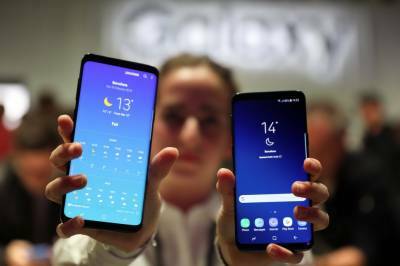 Manila (Web Desk): Samsung took the wraps off its Galaxy S9 line on Monday, answering headline features of chief rival Apple's iPhone X, while positioning its camera as the industry's best, the international media reported. According to details, the Galaxy S9 and the iPhone X are nearly identical in screen size at 5.8 inches, both with Quad HD resolution. They also both come in shiny glass bodies surrounded by a metal rim, aluminum for Samsung and sturdier steel for Apple. The S9 though has only a single lens shooter at the back, unlike the twin lenses on the iPhone X. The larger S9+, with a 6.2-inch screen, has a dual lens camera which is similar to the iPhone's, allowing optical zoom. The S9 can be unlocked using a combination of face and iris scanning. It also has a fingerprint sensor at the back, located below the camera. The iPhone X ditched the fingerprint sensor for Face ID, which is not always reliable according to reviews. Samsung answered Apple's novel "animoji" or animated emoji feature with AR Emoji. Unlike the iPhone X, which mirrors the user's facial expressions only to cartoon images, the S9 can also create an augmented reality version of the user's face. The skin tone, hair and clothes on Samsung's AR Emoji can be customized and will offer images of Disney characters, the company said. The S9 is a re-imagining of the mobile camera, according to Samsung and supposedly produces 60-percent brighter images compared to the S8. The S9 will ship with Android 8.0 Oreo with Samsung's Experience 9 skin on top. The iPhone X runs on iOS 11. Both phones are powered by the most advanced processors for their platform, Qualcomm Snapdragon 845 or Exynos 9810 for the S9 depending on the region, and the Apple's in-house A11 for the iPhone. The most obvious difference is the price. The 64GB Galaxy S9 will retail for P45,990, P18,500 less than the iPhone X with similar storage capacity.